Caleb started preschool today, for the THIRD, and, thankfully, last time. 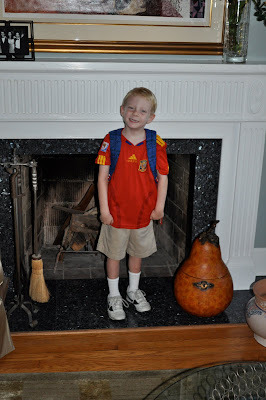 His new school is a much-sought after and I'll admit, fervently prayed for, situation. It is an English/Spanish bilingual public charter school in Washington, DC. The instruction is done in both languages each day and will give Caleb a much better chance of maintaining and utilizing both languages with equal facility. We applied for this school's lottery nearly 6 months ago and were doing the dance of joy when his name was selected for one of 11 slots. There were nearly 100 children placed on the waiting list for those few spaces and we clung to his/ours desperately for months hoping nothing would go awry and that when he showed up today, he'd be expected. He was. HUZZAH! Applying to preschool in the District of Columbia was more complicated than applying to graduate school -- I do NOT exaggerate. Even now, we have not been able to fully demonstrate our DC residency and are scheduled for a home visit from the Director to prove we are who we are, and more importantly, that we live at the address we claim as our abode. No suburbanites for these folks. If you want the benefit of the most education $$$ spent per child anywhere in the US of A, you must also prove you live in the wholly unrepresented boundaries of the District. We are home owners here, but that is insufficient. We have (or will have tomorrow) DC driver's licenses, again, not enough. Our pay-stubs show DC's exorbitant income taxes are being deducted monthly, but the address on the pay-stub and our home address don't match, so, no dice. Like I said, complicated. It's no wonder I never changed my maiden name to the married one simply to avoid one more exchange with any branch of the DC government. True story. Caleb was in school for almost 8 hours today -- which seems stunningly long, no? But, he came home bubbling over with stories about his teachers and new friends, lunch and breakfast fare (both are provided for a small fee) and his favorite thing about the school, the day and likely the entire year, the rooftop playground. 6 stories up swinging, sliding, jumping, running, monkey barring and staring at neighboring rooftops is a 4 year-old boy's never even dreamt of dream come true. And the best part for me is, he couldn't wait to tell Isaac all about it. I can just imagine the day when he'll get to take Isaac to the playground in person...moments like that are what make parenthood pretty darn spectacular. 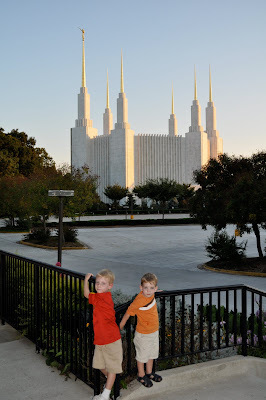 We ended our day with a Family Home Evening trip to the Washington, DC, LDS temple. We've been telling Caleb there was a temple in DC for months and since the moment we touched down last week he's asked over and over and over again "where's the temple?" If it seems big in the picture, that is because it is. It is the third largest temple and the tallest, at 288 feet. It is visible from far and wide, so much so that traffic reporters use it as a landmark when reporting the road conditions on the DC Beltway. It is a beautiful building any time of year and the grounds are always gorgeous, but at Christmas it is aglow with millions of lights. I am already looking forward to taking Isaac and Caleb to see that. If you can, you should see it for yourself. But, at the very least, come back here, I'll be posting pictures. Hooray for the lottery spot! It's so nice to think of you here on the east coast, just a day's drive south. I'm in DC at the end of September for my fellowship meetings. I'll email you...I don't know how much free time they'll give us, but I'd love to connect with you at some point! So glad that he loved it! Yay! That's wonderful that he got in. O mejor dicho: que bueno que ganaron la loteria! That is so wonderful that he is in that program!! It sounds amazing. I want to play on that rooftop playground, too! I kind of want to see this playground also. Most anything build on a roof is pretty cool. IT was so fun to get caught up. As always, this blog is one of the most interesting out there! As usual, fascinating stuff Ms. Linsey!! My sweet friend Erin lives in Arlington and I want you two to meet, she's young, darling, sweet, and fun with three equally adorable children. Alas, she is moving home to Cali soon...check out her blog at thehaphazardlife.blogspot.com . You would LOVE her!!!! PS. Glad you are all safe and sound in the good old USA. Another comment....I bet you're loving that the electricity and water always work!!!! And Target...are you loving Target? So you are officially one of The Real Housewives of DC. Yippee!